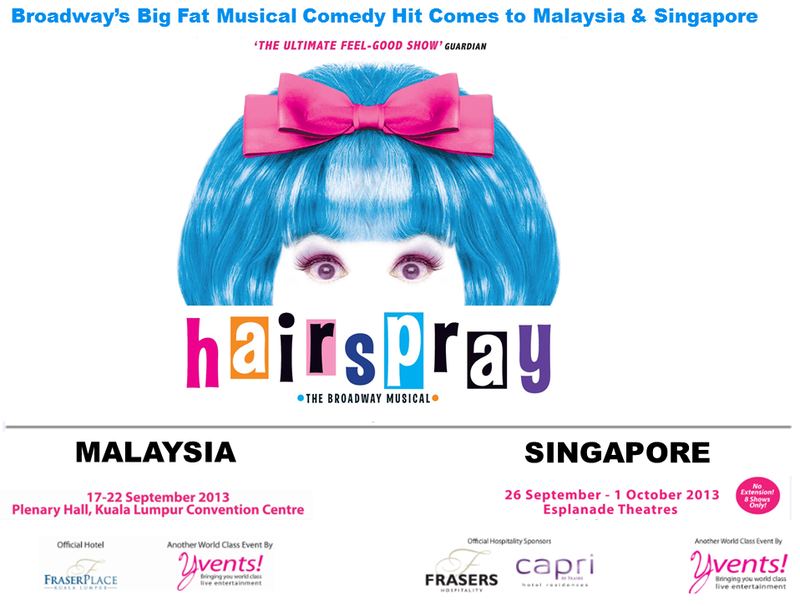 The eight-time Tony Award-winning musical, HAIRSPRAY, will premiere in Malaysia and Singapore this September! The musical was inspired by the 1988 film by John Waters of the same name. An American romantic musical comedy, it starred Ricki Lake, Divine, Debbie Harry and Sonny Bono, among others. The film became a cult classic, and in 2002, was adapted into a broadway musical. In 2007, another film adaptation of Hairspray was released which starred John Travolta, Zac Efron and Nikki Blonsky. HAIRSPRAY centers around Tracy Turnblad, an overweight teenager who loves dancing and is a fan of the Corny Collins Show. When one of the show’s stars leave, Corny Collins holds an audition, and with the help of her friends, Tracy makes it onto the show. Her dancing skills also attract the attention of Link Larkin, the heartthrob of the show. However, life is not all roses for Tracy. The Corny Collins Show’s manager, Velma Von Tussle and her scheming daughter, the dance queen Amber, are not happy with the decision to have Tracy on the show. As they plot to destroy Tracy, all hell breaks loose. HAIRSPRAY is a show that guarantees great entertainment for the whole family, so be sure not to miss it! It will run from 17-22 September 2013 at the Plenary Hall, Kuala Lumpur Convention Centre in Malaysia. Fraser Place Kuala Lumpur is proud to be the official hotel of this event. And if you’re planning to catch the musical in KL, good news! Buy 2 tickets at RM980.00nett and enjoy 1 complimentary room night stay inclusive of breakfasts for 2 persons. For more info on this promotion, you can contact sharifah.laila@frasershospitality.com. From there, the show will move on to Singapore, where it will run from 26 September to 1 October at the Esplanade Theatres. All Frasers Hospitality properties in Singapore, including Capri by Fraser Changi City, are official hospitality sponsors for the musical. Tickets are on sale now, so hurry and book your tickets today!